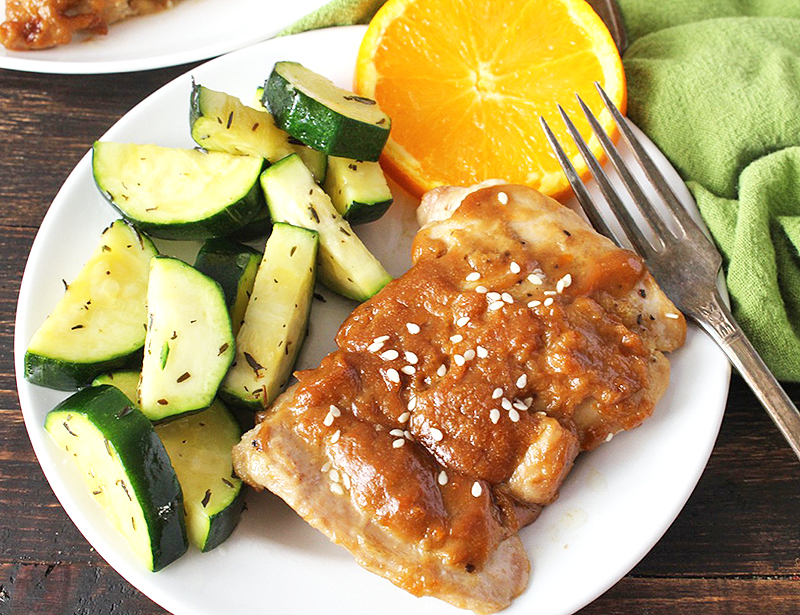 This Paleo Sticky Orange Sunflower Chicken has so much flavor and is easy to make. 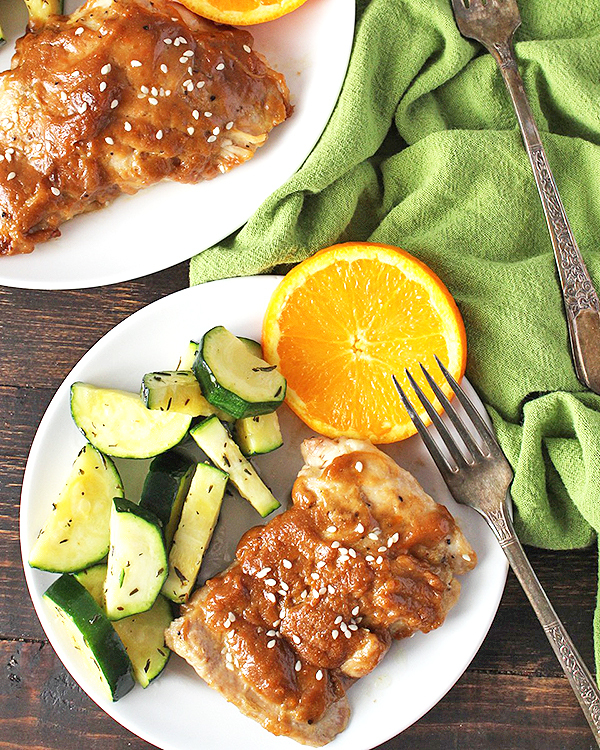 A healthy Whole30, gluten free and dairy free meal that you will love! This recipe came about in a different way than usual. I saw it on another bloggers site, noticed it was from a paleo cookbook, ordered the cookbook and asked the author if I could share it. She agreed and I’m so happy because I have made this too many times to count! 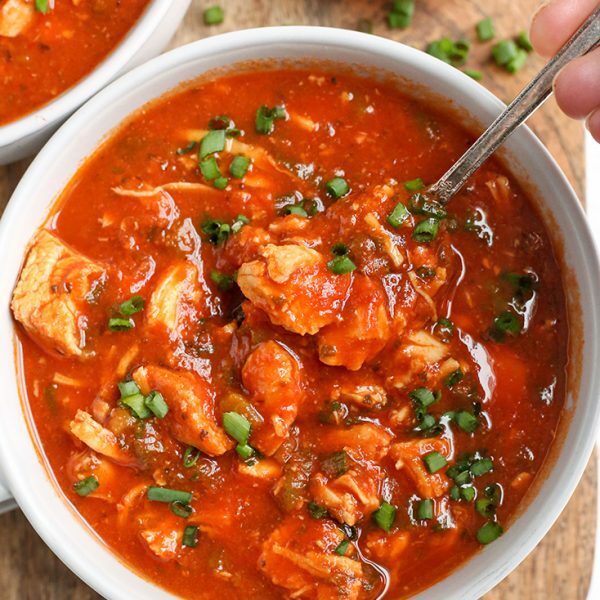 As soon as I read the ingredient list I knew my husband would love it- he likes big, bold flavors and that is exactly what this chicken has. 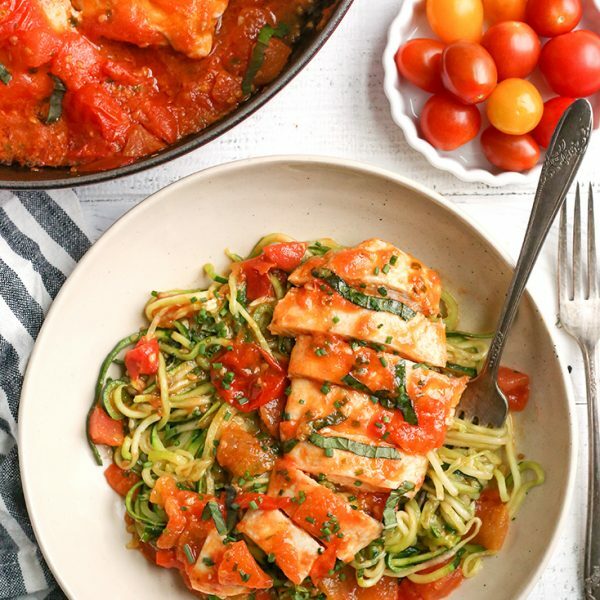 This recipe is from Well Fed Weeknights by Melissa Joulwan. 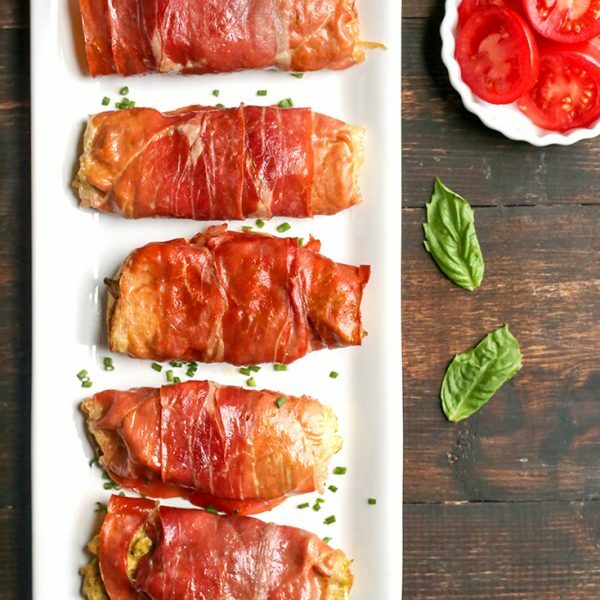 It’s full of meals that can be made in 45 minutes of less and these are not boring in any way! If you are looking for fun, unique recipes that will get you our of your dinner rut then you will love this book! I have also tried a couple other recipes from the book (Thai Basil Beef and Mole Meatballs) and I’m super impressed with them! This chicken is easy to make and while the ingredient list looks a little long, it comes together quickly. 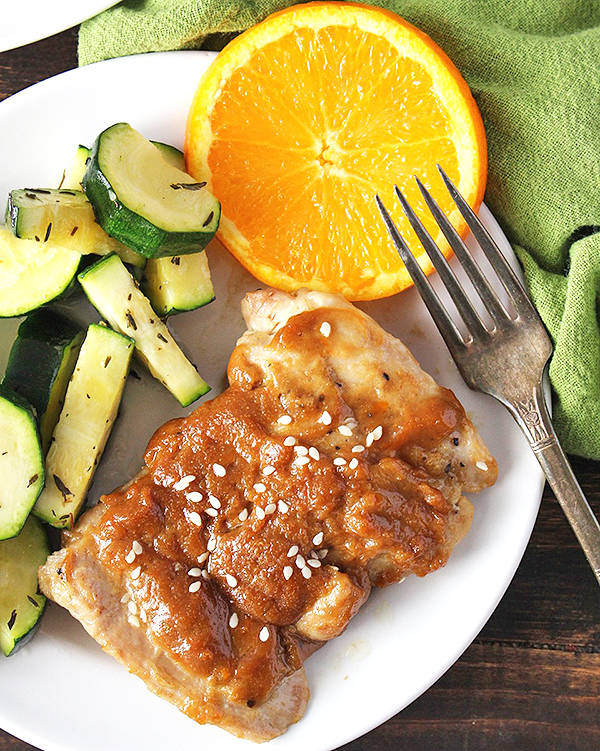 The slight sweetness from the orange paired with the sunflower butter, ginger, and fish sauce create an amazing combination of flavors that you might not think work together, but totally do. And let me tell you how important that orange is! One time I had already started making it and realized I only had grapefruit- yeah, not the same! NOTE: I have made this recipe many, many times as written, but we are currently following a low-FODMAP diet right now so I left out the tomato paste, hot sauce and garlic this time and it was just as delicious! Preheat the oven to 425° and get out a 2-quart baking dish. Make the sauce: Zest and juice the orange into a small bowl. Add in the garlic, coconut aminos, sunflower butter, tomato paste, vinegar, fish sauce, hot sauce, and arrowroot powder. Whisk until fully combined and set aside. Prep the chicken: combine ginger, garlic powder, salt, coriander, and black pepper in a large bowl and mix it with a fork. Add the chicken to the spices and toss to coat. Add the oil to a large non-stick skillet and heat over medium-high heat for 2 minutes. Add the chicken in a single layer and brown it, undisturbed for 3-4 minutes. Flip the chicken and brown the other side for 1 minute then transfer to a 2-quart baking dish. Thicken the sauce: Pour the sauce into the pan that was used for the chicken and heat it, scrapping any brown bits in the pan, until it is thickened a little, 1-2 minutes. Pour the sauce over the chicken and bake for 15-20 minutes until the sauce has caramelized. * To make low FODMAP, leave out the tomato paste, hot sauce and garlic. It is still flavorful and delicious! This looks amazing. Another great chicken recipe to enjoy! 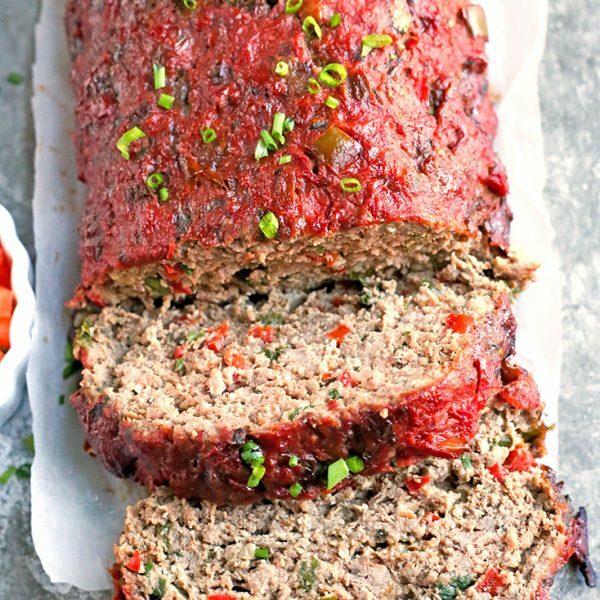 This looks like such a great dinner or lunch dish to share with anyone! Thanks, Hannah! Yes- it is a crowd pleaser! 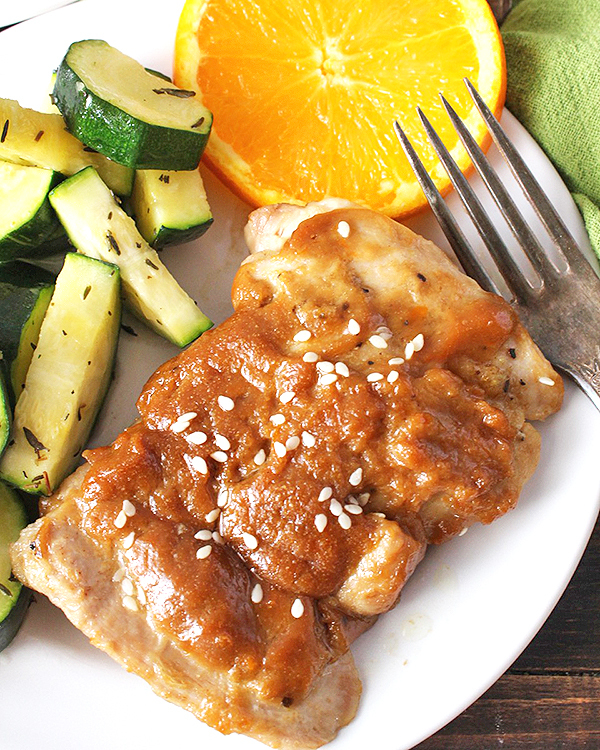 Oh my that sticky orange sauce sounds utterly divine! Do you think it would work well with white fish at all as I don’t eat meat? Saw this on Insta and can’t wait to try it. That sauce sounds SO good! Hi Erick- yes, that will work. Hope you enjoy!